Our range of products include Celestron NexStar 4SE Telescope, Celestron NexStar 5SE Telescope, Celestron NexStar 6SE Telescope, Celestron NexStar 8SE Telescope, Galileo SKY 150mm EQ D-150- F-750mm EQ Reflector Telescope and Galileo Sky 6 inch Dobsonian D-153- F-1200mm Telecope. The Celestron NexStar 4SE telescope combines high quality Celestron optics with StarBright XLT enhanced coatings for maximum light transmission and clarity. Celestron NexStar 4SE telescope features 102mm (4") aperture in a Maksutov design with a long focal length (f/13) for high magnification views. The Celestron NexStar 4 SE comes standard with a pre-assembled tripod. Includes fully computerized operating system, flash upgradeable hand control, superior coatings, Celestrons revolutionary SkyAlign telescope alignment software, two-year Celestron warranty and much more! The days of complicated telescope assembly and setup are over. The Celestron NexStar 4SE telescope can be set up in a matter of minutes with no tools required! Computerized hand control with a database of nearly 40,000 objects and a motorized altazimuth mount and quick release optical tube for easy, no-tool set-up. SkyAlign allows you to align on any three bright objects, for a fast and easy alignment process and StarPointer finderscope to help with alignment and accurately locating objects. Flash upgradeable hand control; update your the operating software of your telescope via the Internet and all NexStar SE models are GPS-compatible and come standard with an auxiliary port for use with additional accessories. Internal battery compartment to prevent cord wrap during use and includes NexRemote telescope control software for advanced control of your telescope via your computer. "THE SKY" Planetarium software - with a 10,000 object database, printable sky maps, and enhanced images. Linear Field of View @ 1000 Yards 52.5 ft.
Celestron Nexstar 6SE telescope includes fully computerized operating system, flash upgradeable hand control, superior coatings, revolutionary SkyAlign telescope alignment software, two-year Celestron warranty and more! The days of complicated telescope assembly and setup are over. 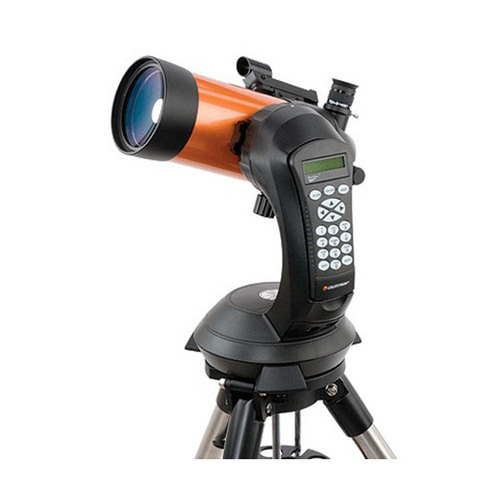 Celestron NexStar 6SE telescope can be set up in a matter of minutes with no tools required! The Celestron NexStar 6SE GT combines high quality Celestron optics with StarBright XLT enhanced coatings for maximum light transmission and clarity. Features 150mm (6") aperture in a Schmidt-Cassegrain design with a long focal length (f/10) for high magnification views. The Celestron NexStar 6SE telescope comes standard with a pre-assembled tripod. Mirror Cell Stability treated die-cast alluminum, provide better and stable alignment. Resolving Power 0.8 Arc - Seconds. This Dobsonian Telescope 153mm/1200mm (6") have a "parabolic" primary mirror to eliminate spherical aberration and a four-arm, secondary- mirror bracket with fine supports , to reduce diffraction spikes and light loss. This model also include the new feature-tension control handle. Resolving Power 0.74 Arc - Seconds. With 35mm Extensio Tube 1.25"
Eyepiece Standard 1.25" 25mm (1.25") 52° field. Eyepiece Standard 1.25" 9mm (1.25") 52° field. Mount type DOBSONIAN- wooden base. D200 - Reach Farther Into Deep Space Than You've Ever Imagined! Caution: Objects viewed with this instrument are farther away than they appear. MUCH, MUCH farther away! They just look so vivid and close because the D200's mighty 8" optics pull in photons by the bucketful. And with its brawny mount with built-in smooth system, this formidable package takes deep-sky observing to a whole new level. For the serious astronomy enthusiast seeking large-aperture resolving power and superior control, this space-penetrating powerhouse can be yours for a surprisingly low price, considering how much scope you get! This is not a telescope for the faint of heart. It’s big and quite a load, to be sure. But if its size and weight don’t faze you, you are in for years of incredible observing adventures! 2" Precision Micro 10:1 Crayford style focuser". DOBSONIAN- wooden / with Roller Bearing wooden base. Primary Mirror 10 inch Paraboli 1/12 wave. Resolving Power 0.46 Arc - Seconds. Eyepiece Standard 1.25" Premium Plossl 9mm (1.25") 52°field. Cooling fan for "thermal equilibrium"
Primary Mirror 12 inch Parabolic 1/12 wave. Resolving Power 0.38 Arc - Seconds. 2" Precission Micro 10:1 Crayford style focuser". The ST80-A (for "Astronomy") is an upgraded version of the ever-popular Orion ShortTube 80 telescope. Now improved with fully multi-coated optics and a soft carrying case, the "little scope that could" is better than ever! The Orion Short Tube 80 is a fantastic astronomy telescope that is portable enough to take anywhere, and you'll love its bright, wide-field views. The 80mm objective lens and short 400mm (f/5.0) focal length are perfect for taking in wide swaths of the heavens, making it ideal for larger deep-sky objects. You'll see spectacular star clusters, wispy nebulas, and expansive galaxies with this telescope, but it also excels at viewing objects in our solar system. Enjoy experiencing the phases of the Moon and tracking the motions of the planets with crisp views of Saturn's rings and Jupiter's moons. Multi-coating on all air-to-glass optical surfaces of the Short Tube 80 ensures maximum light transmission for sharp, accurate image fidelity. This package includes an aluminum rack-and-pinion focuser (1.25"), a 90° mirror diagonal, a large 8x40 finder, tube rings, and two Expanse eyepieces (20mm and 9mm), and the convenient mounting block attaches easily to a wide variety of mounts. The Orion Short Tube 80 telescope is a great way to get started in astronomy — or add a portable second scope to your astro arsenal.